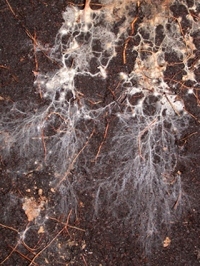 Mycorrhizal fungi work by attaching themselves to the root of your plant. This extends the root system further into the ground, letting your plant get more water and nutrients, and from farther away. The end result is that your plants have more of what they need to stay strong and healthy- and because they’re healthier, are more tolerant to adverse weather conditions like drought, excessive heat, or high winds. Isn’t mycorrhizal fungi already in the soil? Mycorrhizal fungi exists in soil that hasn’t been tampered with. That means if the soil has been tilled, topsoil has been removed, erosion has occured, or the soil has been fumigated, then some of the mycorrhizae has been stripped. So, to help restore the natural eco-system of the soil, we’re helping to put back what was there in the first place. How is mycorrhizal fungi beneficial? Mycorrhizal fungi populate the area around a plant’s roots and form very thin filaments, adding to the length and efficiency of a plant’s roots. It’s actually like having a second set of roots for the plants. Plants, trees, and shrubs with a well established root system are better able to survive things like droughts and transplant shock. They also absorb more nutrients from the soil. Plants with mycorrhizal fungi can survive better in their non-native environments. Terra-One™ and Terra-One™ Growers Blend Contain Our Special Blend of Mycorrhizal Fungi. Video courtesy of our partners at Mycorrhizal Applications.